, an eminent dissenting minister and political writer, was born Feb. 23, 1723, at Tynton, in the parish of Langeinor, in Glamorganshire. His father, who was many years minister of a dissenting congregation at Bridgend in the same county, intended him for trade, | but gave him a good education, in the course of which, however, he became dissatisfied with his son’s departure from his own views of religion, which were Calvinistic. He died in 1739, while his son was a scholar at a seminary at Talgarth, and a scholar of more than ordinary thinking. In 1740 we are told that he first engaged in studying Butler’s “Analogy,” a work which never ceased to be the subject of his praise and admiration. 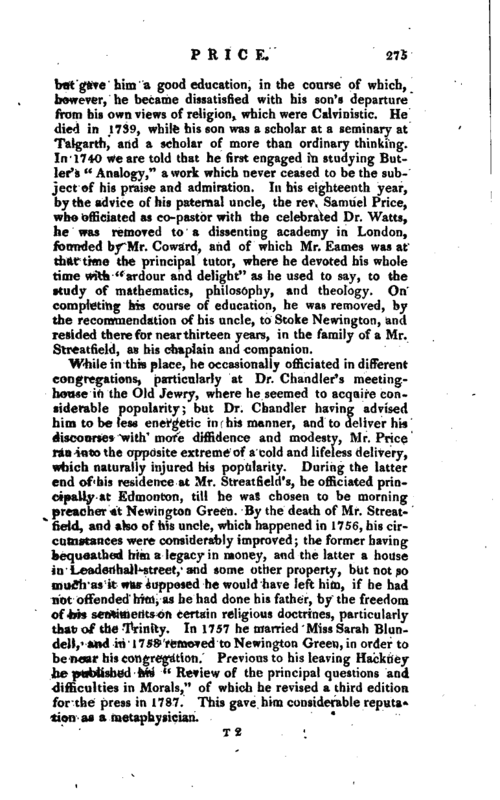 In his eighteenth year, by the advice of his paternal uncle, the rev, Samuel Price, who officiated as co-pastor with the celebrated Dr. Watts, he was removed to a dissenting academy in London, founded by Mr. Coward, and of which Mr. Eames was at that time the principal tutor, where he devoted his whole time with “ardour and delight” as he used to say, to the study of mathematics, philosophy, and theology. On completing his course of education, he was removed, by the recommendation of his uncle, to Stoke Newington, and resided there for near thirteen years, in the family of a Mr. Streatfield, as his chaplain and companion. While in this place, he occasionally officiated in different congregations, particularly at Dr. Chandler’s meetinghouse in the Old Jewry, where he seemed to acquire considerable popularity; but Dr. Chandler having advised him to be less energetic in his manner, and to deliver his discourses with more diffidence and modesty, Mr. Price ran into the opposite extreme of a cold and lifeless delivery, which naturally injured his popularity. During the latter end of his residence at Mr. Streatfield’s, he officiated principally at Edmonton, till he was chosen to be morning preacher at Newington Green. By the death of Mr. Streatfield, and also of his uncle, which happened in 1756, his circumstances were considerably improved; the former having bequeathed him a legacy in money, and the latter a house in Leadenhall-street, and some other property, but not so much as it was supposed he would have left him, if he had not offended him, as he had done his father, by the freedom of his sentiments on certain religious doctrines, particularly that of the Trinity. In 1757 he married Miss Sarah Blundell, and in 1758 removed to Newington Green, in order to be near his congregation. Previous to his leaving Hackney he published his “Review of the principal questions and difficulties in Morals,” of which he revised a third edition for the press in 1787. This gave him considerable reputation as a metaphysician. 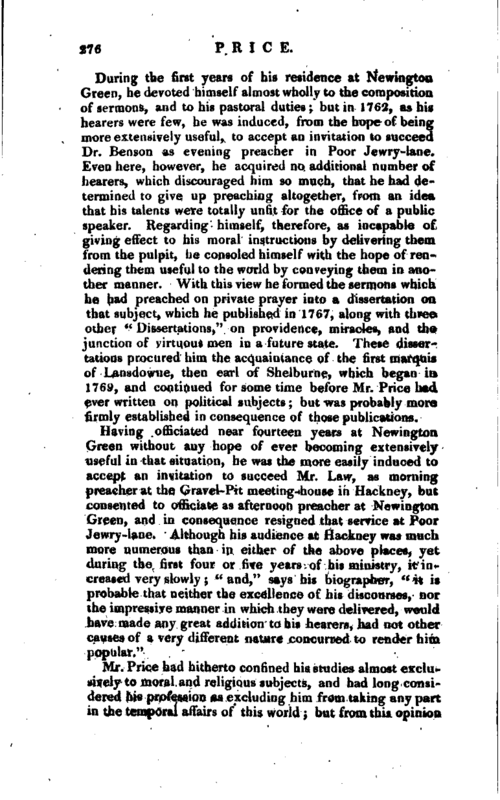 | During the first years of his residence at Newington Green, he devoted himself almost wholly to the composition of sermons, and to his pastoral duties; but in 1762, as his hearers were few, he was induced, from the hope of being more extensively useful, to accept an invitation to succeed Dr. Benson as evening preacher in Poor Jewry-lane. Even here, however, he acquired no additional number of hearers, which discouraged him so much, that he had determined to give up preaching altogether, from an idea that his talents were totally unfit for the office of a public speaker. Regarding himself, therefore, as incapable of giving effect to his moral instructions by delivering them from the pulpit, he consoled himself with the hope of rendering them useful to the world by conveying them in another manner. With this view he formed the sermons which he had preached on private prayer into a dissertation on that subject, which he published in 1767, along with three other " Dissertations,' 7 on providence, miracles, and the junction of virtuous men in* a future state. These dissertations procured him the acquaintance of the first marquis of Lansdowne, then earl of Shelburne, which began in 1769, and continued for some time before Mr. Price had ever written on political subjectsbut was probably more firmly established in consequence of those publications. 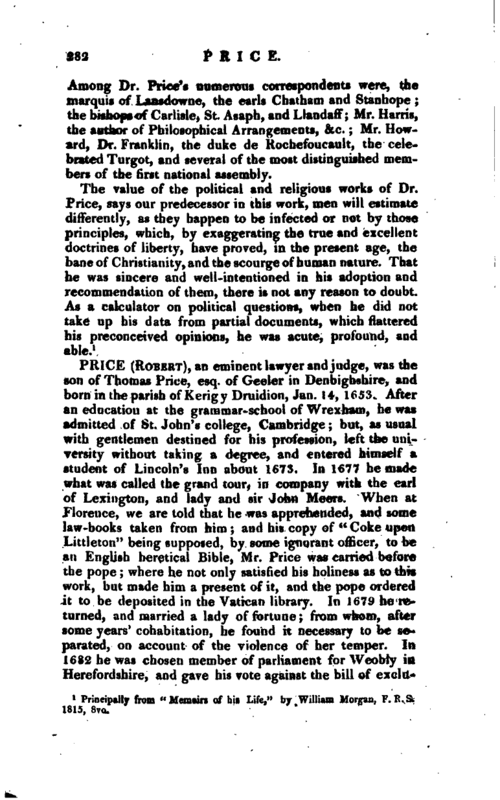 Mr. Price had hitherto confined his studies almost exclusively to moral and religious subjects, and had long considered his profession as excluding him from taking any part in the temporal affairs of this world but from this opinion | he now began gradually to depart, and first bestowed a share of his attention on philosophical studies, which produced many valuable papers inserted in the “Philosophical Transactions” of the Royal Society of London, of which he had been chosen a fellow in 1765. So intent was his mind in one of his investigations, that we are told, the colour of his hair, which was naturally black, became changed in different parts of his head into spots of perfect white. In 1769 he published his valuable “Treatise on Reversionary Payments,” which contained, among a variety of other matters, the solution of many questions in the doctrine of annuities; schemes for establishing societies for the benefit of age and widows on just principles; and an exposure of the inadequacy of the societies of this kind which were continually forming in London and other parts of the kingdom. Altogether this was perhaps his most useful performance. About the end of 1769, the university of Glasgow, conferred on him the degree of doctor of divinity, without any solicitation or knowledge on his own part, but, as his biographer candidly acknowledges, in consequence of the application of some of his clerical friends in Londo.n, who paid the usual fees, and left him to suppose that the honour was entirely gratuitous. This work was followed in 1772 by his <c Appeal to the public on the National Debt, 77 the principal object of which was to restore the sinking fund which had been extinguished in 1733; and although the proposition then met with much opposition, we have lived to see it adopted by parliament, and become one of the chief bulwarks of our public credit. We have also lived to see that the view he took of public affairs, and his dread of a lessened population, which he represented in the most gloomy colours, were not founded on facts, nor have been confirmed by experience. The same opinions, with others of a more general kind, led him to oppose the measures which ended in a war with America. In 1775 he published “Observations on Civil Liberty and the Justice and Policy of the War with America, 77 which was followed, in the same spirit, in 1777, by another pamphlet entitled” Observations on the Nature of Civil Government. 77 The principles of both these works encountered a variety of opinions, being both extravagantly praised and censured: by some esteemed without fault; while by others they are deemed visionary and chimerical, mischievous in their theory, and tending | in their effect to the unhinging of all government That their influence was very great, cannot be denied but that their author was firmly persuaded of their usefulness, seems to be generally believed by those who have had the best opportunities of knowing his sentiments. For writing this last pamphlet, he had the honour to receive the thanks of the Court of common-council the 14th of March, 1776, as having laid down those principles upon which alone the supreme legislative authority of Great Britain over her Colonies could be justly or beneficially maintained and for holding forth those public objects without which it must be totally indifferent to the kingdom who were in or who were out of power. At the same time he also received a gold box of the value of fifty pounds. With these two pamphlets he had determined to take no further part in the political contentions of that period; but, his biographer observes, he certainly mistook the disposition of his own mind. Whenever therefore government appointed a fast, he considered it more as a political than a religious ordinance, and always took an opportunity on that day, to deliver his sentiments on the conduct of the war, and on the evil consequences which were likely to result from it. This insured him at least one overflowing congregation in the year, for curiosity brought foes as well as friends to hear him on such occasions. But of all those discourses, he only published two which he delivered on the fast days in 1779 and 1781. So many exertions in behalf of America procured him an invitation from the congress to “come and reside among a people who knew how to appreciate his talents,” but this he thought proper to decline. In 1779 he published an “Essay on the population of England,” which, being founded on incorrect information, was in proportion incorrect in its conclusions. But finance and politics were not the only subjects which at this period engaged Dr. Price’s time and attention. In consequence of Dr. Priestley’s disquisitions on matter and spirit, which had been just published, he was led to make some observations on those parts which did not accord with his own sentiments. 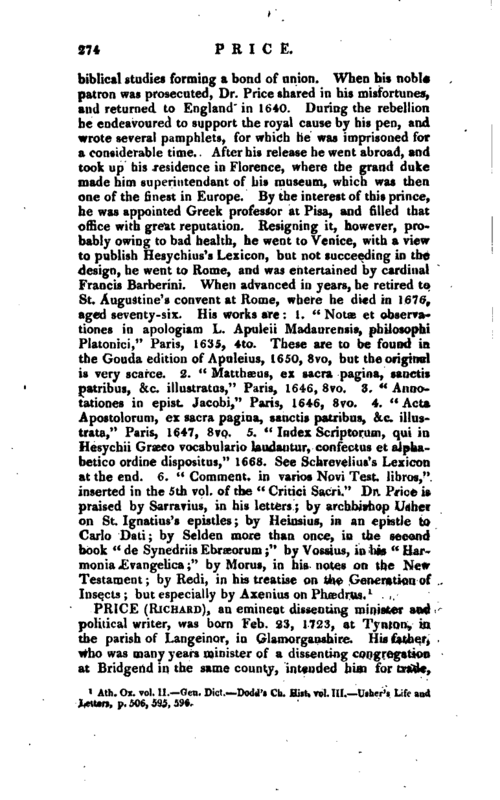 This produced an amicable correspondence between them, published under the title of “A free discussion of the Doctrines of Materialism and Philosophical Necessity.” About the same time he addressed some important observations to the “Society for Equitable Assurances,” in an introduction to | a work by his nephew, Mr. Morgan, on “The Doctrine of Annuities.” The value of his and his nephew’s services to that society is universally acknowledged. When, after the war ended, lord Shelburne came into administration, in consequence of the death of the marquis of Rockingham, his lordship very gravely offered Dr. Price the place of private secretary but, his biographer adds, “his lordship surely could not be in earnest in making such an offer. 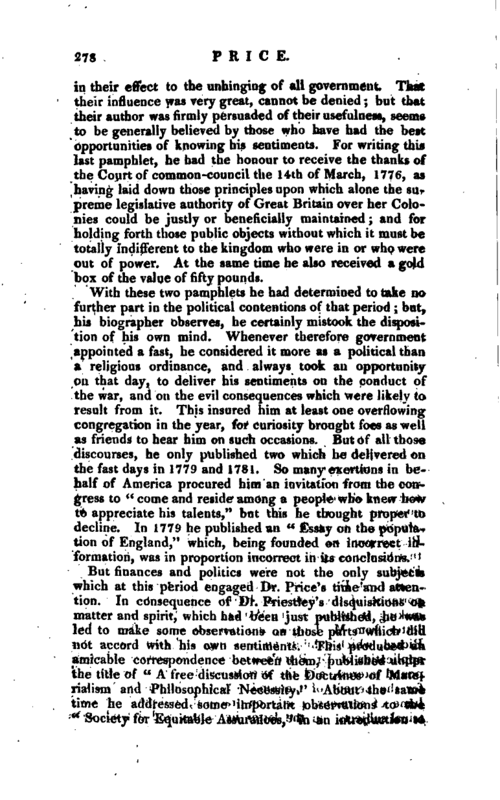 It was no doubt meant as a compliment, and the simplicity of Dr. Price considered it in that light, though, as a friend observed, the minister might as well have proposed to make him master of the horse.” During the time, however, that lord Shelburne was in office, he sought the assistance of Dr. Price in forming a scheme for paying off the national debt, and moved an introductory resolution on that subject in the House of Lords; but, upon his leaving administration, the scheme was abandoned. 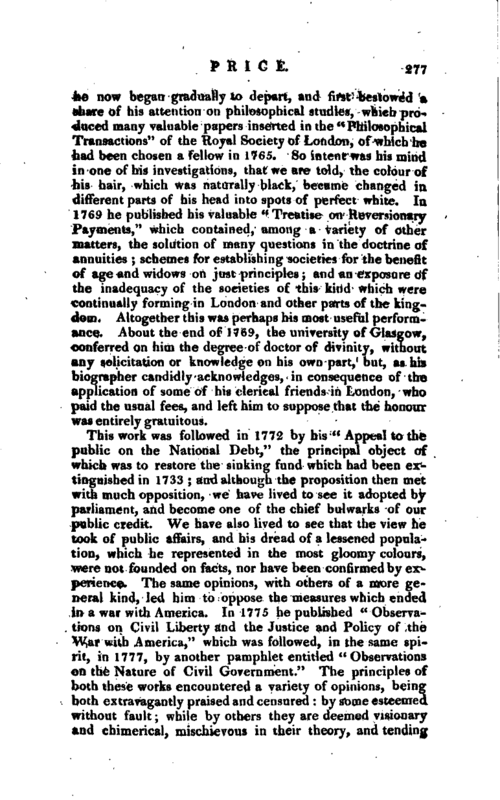 It was, howeVer, communicated to the public by Dr Price in a treatise, entitled “The State of the public Debts and Finances, at signing the preliminary Articles of Peace in January 1783; with a plan for raising Money by public Loans, and for redeeming the public Debts.” After this, when Mr. Pitt determined to introduce a bill into parliament for liquidating the national debt, he applied to Dr. Price for his advice on the subject, and received from him three separate plans one of which now forms the foundation of that act for reducing the public debt, which was established in 1786, and has contributed, more than any other, or all other measures, to raise the credit of his administration. 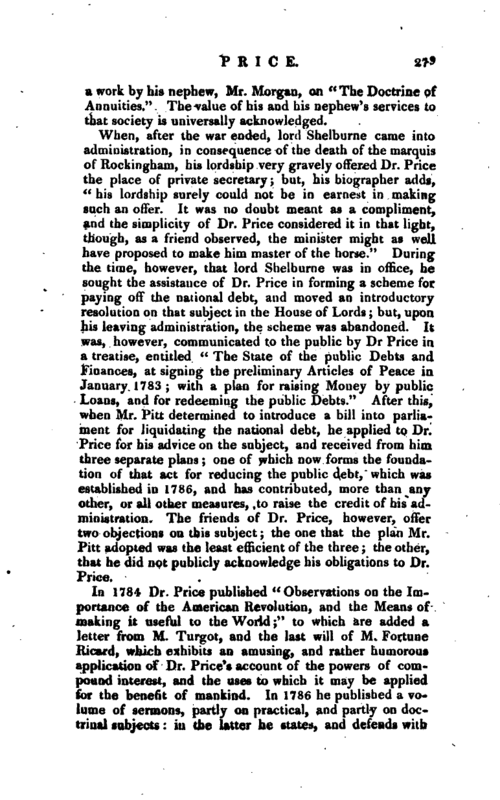 The friends of Dr. Price, however, offer two objections on this subject; the one that the plan Mr. Pitt adopted was the least efficient of the three; the other, that he did not publicly acknowledge his obligations to Dr. Price. In 1784 Dr. Price published “Observations on the Importance of the American Revolution, and the Means of making it useful to the World;” to which are added a letter from M. Turgot, and the last will of M. Fortune Ilicard, which exhibits an amusing, and rather humorous application of Dr. Price’s account of the powers of compound interest, and the uses to which it may be applied for the benefit of mankind. In 1786 he published a volume of sermons, partly on practical, and partly on doctrinal subjects in the latter he states, and defends with | animation and zeal, the Arian hypothesis, to which he himself was attached, against Trinitarians on the one hand, and modern Unitarians on the other. He always felt hurt, we are told, at the conduct of Dr. Priestley and Mr. Lindsay, in assuming to themselves and their sect exclusively, the appellation of Unitarians, which belongs equally to Jews and Mahometans, and in treating with so much contumely the opinions of those who differed from them. As to the practical sermons in this volume, they were very generally approved. The subjects are, the security and happiness of a virtuous course, the goodness of God, and the resurrection of Lazarus. 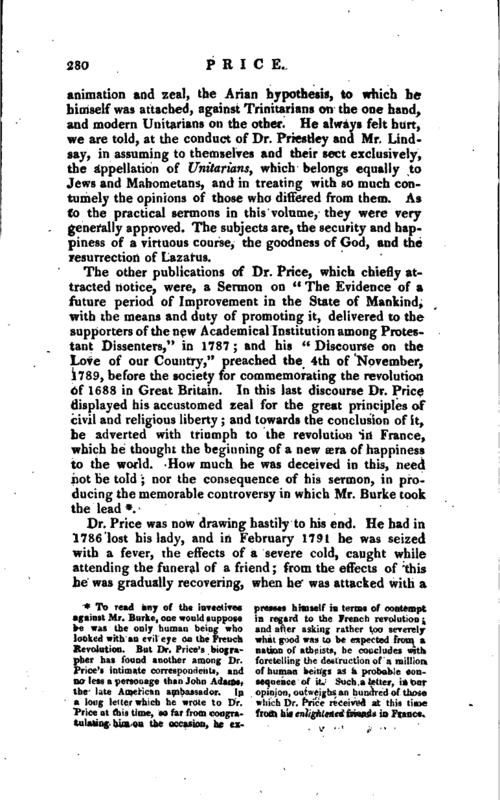 The other publications of Dr. Price, which chiefly attracted notice, were, a Sermon on “The Evidence of a future period of Improvement in the State of Mankind, with the means and duty of promoting it, delivered to the supporters of the new Academical Institution among Protestant Dissenters,” in 1787; and his “Discourse on the Love of our Country,” preached the 4th of November, 1789, before the society for commemorating the revolution of 1688 in Great Britain. In this last discourse Dr. Price displayed his accustomed zeal for the great principles of civil and religious liberty; and towards the conclusion of it, he adverted with triumph to the revolution in France, which he thought the beginning of a new aera of happiness to the world. How much he was deceived in this, need not be told; nor the consequence of his sermon, in producing the memorable controversy in which Mr. Burke took the lead *. * To read any of the invectives presses himself in terms of contempt against Mr. Burke, one would suppose in regard to the French revolution he was the only human being who and after asking rather too severely looked with an evil eye on the French what good was to be expected from a Revolution. But Dr. Price’s biogra- nation of atheists, he concludes with pher has found another among Dr. foretelling the destruction of a million Price’s intimate correspondents, and of human beings as a probable conno less a pereonage than John Adams, sequence of it. Such a letter, in our the late American ambassador. In opinion, outweighs an hundred of those a loug letter which he wrote to Dr. which Dr. Price received at this time Price at this- time, so far from congra- from his enlightened friends in France, tulating him on the occasion, he | exsevere and very painful disorder, by which he had been many years threatened. This he bore with fortitude and resignation, though occasionally his spirits and strength were entirely exhausted by the agonies which he endured. He died on the nineteenth of March, 1791, in the sixtyeighth year of his age, and was interred in Bunhill-fields burying-ground, the funeral being followed by a great concourse of his friends and admirers, to whom he had long been endeared by his private as well as public character. His manners were peculiarly amiable, and whoever was admitted to his conversation, or even perused his works, could not avoid being struck by contrasting his mild and placid temper with that of some of the controversial writers with whom he generally co-operated. He was for many years one of the trustees to the estates of the late Dr. Daniel Williams, which is the most important concern belonging to the London Dissenters. During the applications of the dissenting ministers to parliament, from 1772 to 1779, for relief from subscription to the articles of the church of England, required by the act of Toleration, he was chosen one of the committee appointed to concert and pursue the necessary measures for obtaining that object; but when he found that it could not be obtained without a declaration of faith in the Holy Scriptures, which he contended the civil magistrate had no right to demand, he divided with a small minority of his brethren against the rest of the committee, refusing an enlargement of religious liberty on terms which, according to their views of things, and according to the true principles of dissent, implied submission to the authority of the civil magistrate in matters of conscience, to whom, in matters of this kind, they owed no obedience whatever. In 1783 the degree of LL. 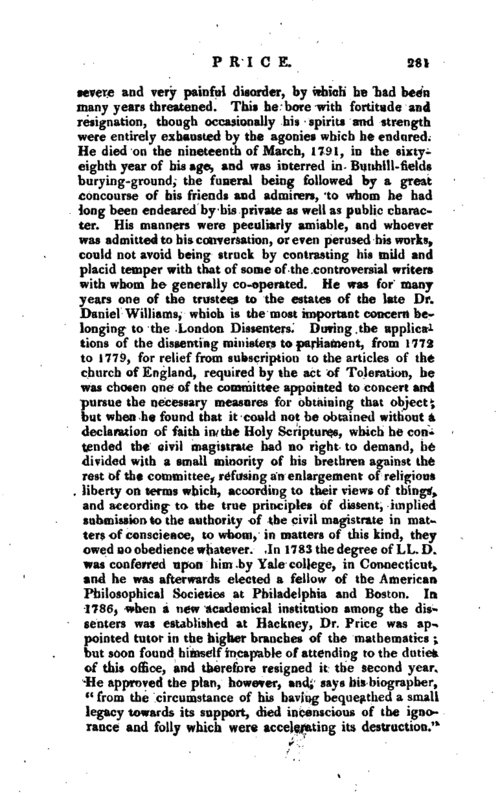 D. was conferred upon him by Yale college, in Connecticut, and he was afterwards elected a fellow of the American Philosophical Societies at Philadelphia and Boston. In 1786, when a new academical institution among the dissenters was established at Hackney, Dr. Price was appointed tutor in the higher branches of the mathematics but soon found himself incapable of attending to the duties, of this office, and therefore resigned it the second year. He approved the plan, however, and, says his biographer, “from the circumstance of his having bequeathed a small legacy towards its support, died inconscious of the ignorance and folly which were accelerating its destruction.” | Among Dr. Price’s numerous correspondents were, the marquis of Lansdowne, the earls Chatham and Stanhope the bishops of Carlisle, St. Asaph, and Llandaff; Mr. Harris, the author of Philosophical Arrangements, &c. Mr. Howard, Dr. Franklin, the duke de Rochefoucault, the celebrated Turgot, and several of the most distinguished members of the first national assembly. Principally from “Memoirs of his Life,” by William Morgan, F. R. S. 1815, 8vo.